I had never never, but never had the inspiration to look like a boy, if you didn't notice yet I'm super super, supa dupa GIRLISH. There is my world, full of bows, hearts, flowers, dots and little girlish details. I keep on saying that I should work on Moschino, that would be a dream brand to work has it really fits my style ( I will keep on sending Cv's). But sometimes some details stollen from the men's wardrobe can make a twist on your look. Next winter has the last one some of the designers propose some looks inspired on the men's wardrobe. Bonnie & Clyde (1967). Hermés Fall-Winter 2010-2011; Miu Miu shoes Pre-Fall 2010. 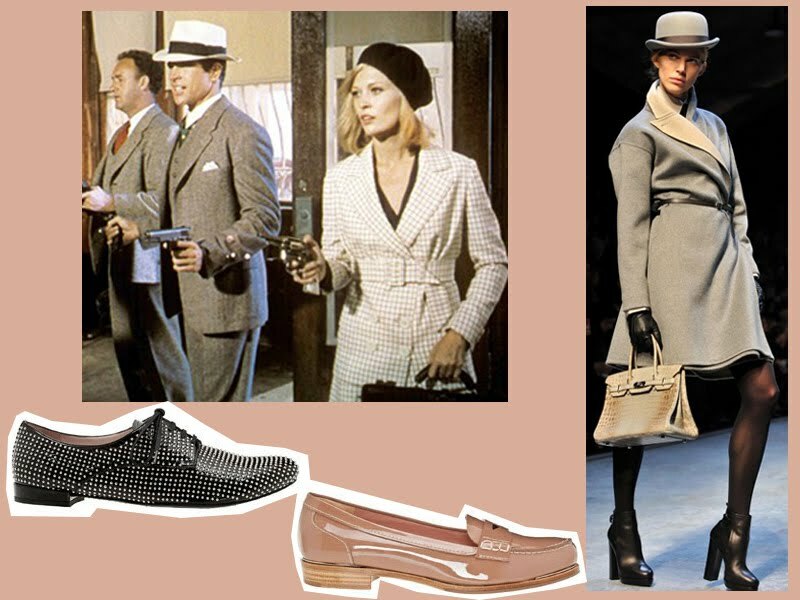 The film "Annie Hall" (1977); Chloé Fall-Winter 2010-2011;Ralph Lauren bag; Chloé shoes Fall 2010. These loafers are one of my last buys for the next season, a pair of shoes bought on the sales with an eye on the next season and sure I will make good use of them. Very nice research! always improving.